A measure of how expensive it is for banks to borrow has increased more than five-fold in just four months. 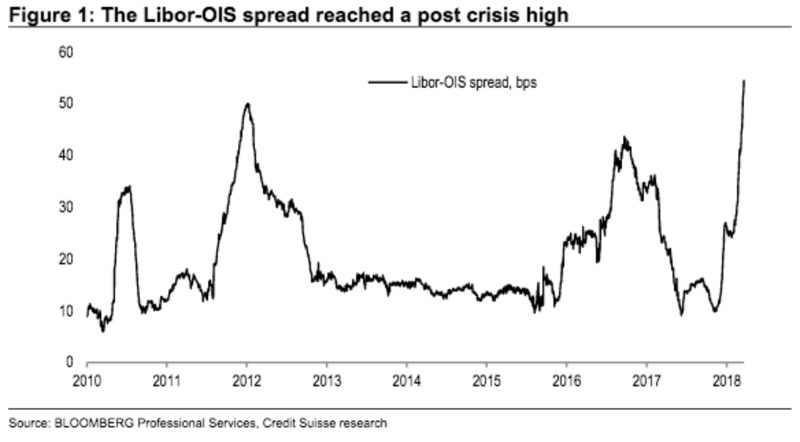 Libor-OIS just surpassed levels last seen in 2011, and is now at its highest point since the financial crisis. Rising Treasury bill issuances and tax reform could be to blame. A short-term borrowing indicator has hit its highest point since the Great Financial Crisis, but that doesn’t necessarily mean another meltdown is on deck. The spread between London Interbank Offered Rate and the overnight index swap (Libor-OIS) – basically a measure of how expensive it is for banks to borrow – has skyrocketed over the past four months, from 0.10% to 0.58%. But the sharp widening has more to do with recent political moves than with systemic glitches in the economy, analysts at Credit Suisse wrote in a note to clients sent out on Friday. Other indexes, including the high-yield spread, aren’t showing signs of stress. And there has been little significant impact on the cross-currency basis, which measures the cost of borrowing US dollars backed by foreign currencies. So, what’s causing the gap to spread so quickly? Credit Suisse says its rising Treasury bill issuance and President Donald Trump’s tax reform. After Congress voted to lift the debt ceiling last month, the US Treasury Department has been ramping up its cash balances by issuing bills. A record amount of Treasury bills and notes, about $US294 billion, will likely be auctioned this week. Additionally, the US tax overhaul passed in December incentivizes businesses to repatriate money from abroad. Because this decreases demand for offshore treasury bills, foreign banks are instead funding themselves through the interbanking market. 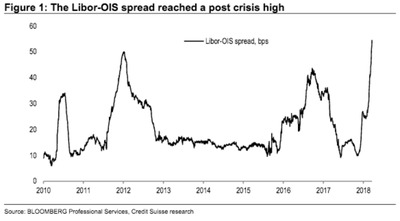 The current Libor-OIS spread is likely nothing more than a product of sweeping political moves over the last few months, according to analysts. But further widening could be cause for concern, especially for Americans. A bigger gap would mean additional funding costs for more than half of US corporations, about 53%, which could hurt at a time when the Fed is also raising interest rates. Additionally, nearly $US1.8 trillion of bonds and 12% of consumer loans are tied to the Libor rate, according to the New York Fed. But Credit Suisse says there’s no need to worry just yet.